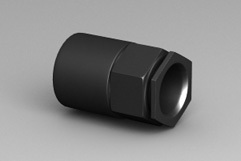 The Threaded Bush is available in 20mm and 25mm in Black, Light Grey, Orange and White. The Threaded Female Adaptors and Threaded Bush are used with Double Switch Boxes, Single Switch Boxes and other Adaptable Boxes. More information on these products here.